Please send all announcements to admin@rrtec.org by Tuesday. Thank you. SUNDAY MORNING SERVICE begins at 9:00AM. RRTEC BOARD MEETING held at RRTEC at 7:00AM. MEN'S BIBLE STUDY will be held from 10:00AM to 11:00AM. LEADERSHIP TRAINING held at RRTEC from 9:30AM to 12:00PM. MINISTERIAL STAFF MEETING held at RRTEC at 9:00AM. 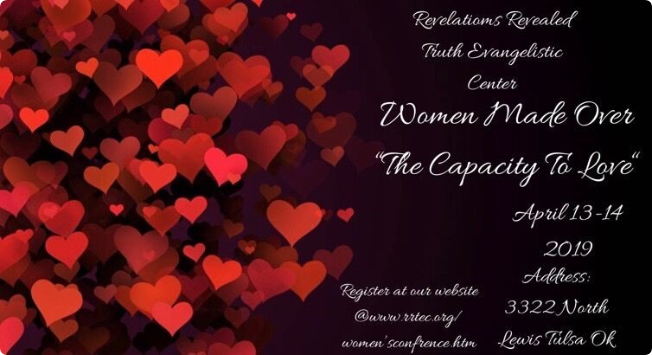 WOMEN'S BIBLE STUDY will be held from 10:00AM to 11:00AM. ©2012 - 2019 Revelations Revealed-Truth Evangelistic Center. All Rights Reserved. Powered by COALESCENT CREATIVE.